“They need to just go in and kill them all, block out the exits and let the police go in and just open fire…” the Barber says accentuating his points with snips of his scissors. I had gone in for a cut but on hearing that I had spent the last week in one of Rio’s largest favelas, Rocinha, covering what started as a drug war and ended as a military occupation I was receiving unsolicited tactical advice on the best way to clean out the slum after more than a week of violence. Video taken by a resident of the community showing the invading faction of ADA. It all started when on Sunday the 17th of September for over 5 hours over 200 armed men of the ADA (friends of friends) drug faction shot it out in a civil war with the objective of gaining control of Rocinha. The favela, home to an estimated 100,000 people, is located in prime real estate on the south side of Rio De Janeiro. Important if you want access to those that have the means to pay for drugs. Rogério 157, the on the ground commander and de-facto king of Rocinha had refused an ultimatum by ADA leadership to leave the favela within a month. Instead he cut ties with the faction and executed those that were close to the narco-enterprises leadership in the favela. ADA responded by invading the favela in force. 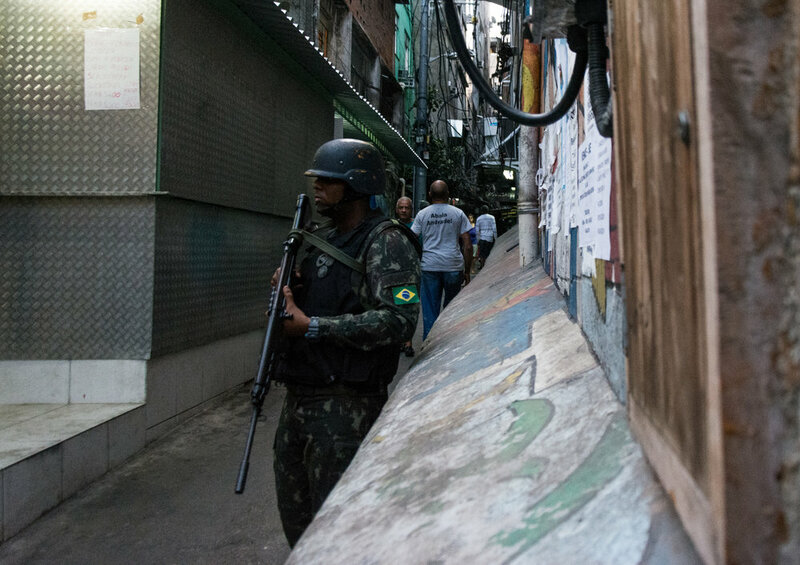 Videos taken by members of the community showed men and teenagers armed with ak-47’s and ar-15’s working their way through the side streets in an attempt to scale the favela. In Rio’s mountain terrain the rule during drug wars is that whomever controls the high ground, controls the favela. In this case Rogério’s foot soldiers still held strong as they shot down on the advancing ADA loyalists without regard for the residents caught in the crossfire. Video Recorded by police inside a forward operating base located in the community. Many criminals with rifles are seen on the street outside. Meanwhile the police were either unable or unwilling to stop the confrontation. A video taken by a police officer from within one of the forward operating bases located inside Rocinha - a part of the program to pacify Rio’s ungoverned areas in the lead up to the Olympics - shows over 20 narco-soldiers walking with large calibre rifles directly outside the station. The police inside tell each other to stay down in order to avoid attracting the attention of the criminals. Later the city's spokesman will say that the police chose not to get involved in order to prevent the risk of escalating the conflict and causing more harm to the residents of the community. For those stuck in the crossfire the lack of control that the state possessed became quickly apparent. By Sunday evening the shooting had ended and 200 of the narco-soldiers have escaped into the jungle surrounding the favela, leaving behind two immolated bodies. A method usually used by the drug gangs to kill captured enemies. Monday morning the police conduct operations in the community but with little success. At night residents report that armed men are again on the street and imposing a curfew that extends beyond the limits of the favela to the surrounding high rises, home to the city's affluent. By Wednesday the situation had devolved to the point that the cities chief of security Roberto Sá requested for the armed forces to be called in to help establish peace within the community. The request was denied by the cities governor on Thursday claiming that it was not necessary. Friday morning the drug gangs burned a bus about 2 km away from the favela in order to draw police attention away from the favela. Later on they attacked the forward operating base of the police in response to operations aimed at capturing Rogério 157. By noon the city had authorized the utilization of the armed forces in the favela in order to reestablish order. The movement of the armed forces were a well known fact. It had been announced hours in advanced and the convoys movement through the city was televised live on TV. Large numbers of people are seen leaving the favela with hastily thrown together bags. Most are resident’s utilizing the momentary calm to withdraw from the favela but it will later be argued that the public announcement and movement of the armed forces gave more than enough time for the remaining criminal elements known to the police to leave in search of safety in favelas outside of government control. Forward Element of the Armed forces arrive in Rocinha. There is a feeling of the calm before the storm as the city watches the progress of the convoy through the city. The first sight of the Federal Forces in the community is that of a pair of helicopters making a lazy turn over the favela as if to dare any remaining criminals to open fire. One of the helicopters peels off and descends in a hover over the police’s forward operating base 2/3rds of the way up the favela disapearing into a dust storm of its own making. Video pased around social networks later will show comand, control and communication personal fast roping into the base to act as a forward element for the armed forces. VBTP-MR Guarani of the Brazilian armed forces sets up a checkpoint near the base of the community. At the base of the favela the infantry start arriving in transport trucks. 950 men armed for war accompanied by Guarani Armored Personal Carriers and logistics vehicles. Onlookers are gathered outside of shops and along the streets looking on in awe and fear. Probably similar to the reaction residents of New York would have if Bradly Fighting Vehicles started rolling through Harlem. Questions murmur through the crowd like “How long will this last?” and “When will the shooting start?” The real question on everyone’s mind is “Who are they here to protect? Us or the surrounding city?” It's not lost on the residents that the reinforcement from the military seems to have coincided with the Rock in Rio music festival, a big international attraction. As night falls on the community an uneasy sense of calm is felt. With such a large contingent of government forces in the community it is not expected that any fighting will break out. Regardless the location of the over 200 criminals brandishing large calibre rifles are still unknown. How they got in and out of the favela without being noticed by the police makes some suspect that that parts of the police force must be complicit in the movement of the criminals. To the surrounding city though many see the favelas as being entirely complicit in sheltering the drug traffickers and have little sympathy for their plight. To those like my barber that don't have to live and work through the crossfire and presence of a homegrown occupying force an escalation in violence is seen as the next logical step. For the residents, they will happily live under whoever stops the violence.